This is a quilt I actually finished almost a year ago. However, it was slated for inclusion in the ill-fated book, so I never shared it on the blog. Since it seems like I may never actually have free time again in the quantities necessary to write a book, and if that day ever does come along I will likely want to do new patterns anyway, I figured I should just go ahead and share it here! I’m also pleased to say that this quilt is going to be hanging at QuiltCon! I actually wasn’t going to include it originally, because I mean… it’s PINK. But there you go, you never know! I’ll share my QuiltCon reject sometime soon that I had figured was a shoe in. Anyway, this quilt. I called this “Mountain Sunrise” because it reminded me of a misty mountainscape sunrise. The design is based on a QDAD design (as were almost all the book designs, actually!) and is really simple to put together as it’s entirely made up of large HSTs. The original design was done in greens, but I converted it to pinks (and made a few other changes to the design) when I reworked it for the book. The quilting is done by Tami @ The Quilted Lemon, who is wonderful to work with. She let me loose on a webpage full of quilting designs and let me pick what I wanted. I ended up going with the triangle shape to mimic the triangles in the design, and she helped me figure out the best size to use with my quilt. I really love how it turned out! I love it even in all its pinkness lol! The quilting was a perfect choice… and if it were me, I would have given up on the binding long before hour 3, so good on ya LOL! 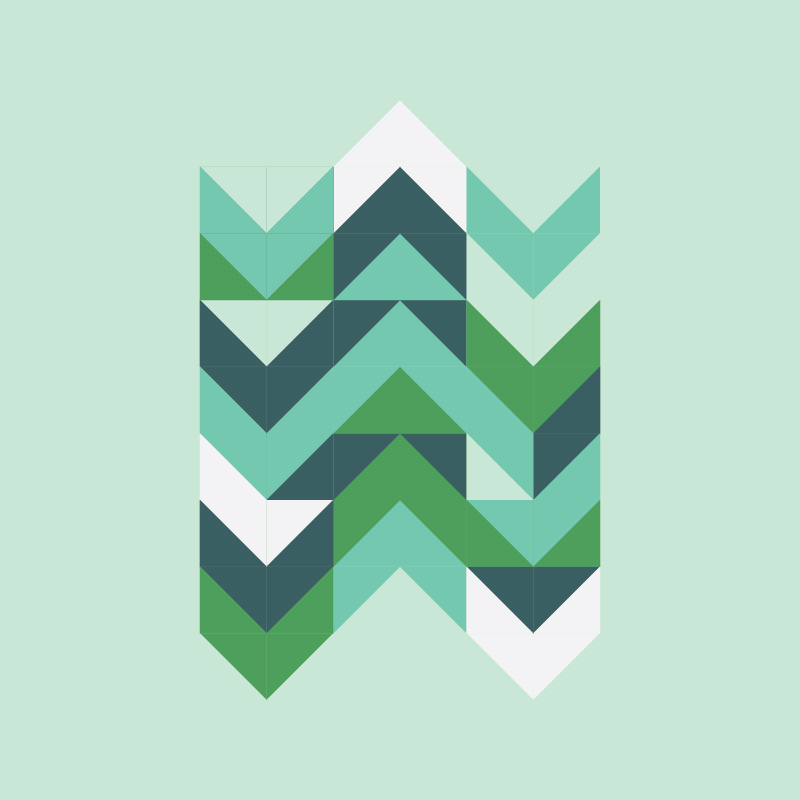 Nice design; I like all the patterns that can come out of HSTs. Funny that your “also ran” made it and the “shoe in” didn’t. Never can outthink those judges. Your quilt is beautiful and I love the touch of pink in the binding. The quilting design is perfect. Can’t wait to see the other quilt. QuiltCon is not in the cards for me this year. Thank you so much, Rejeanne! Do you think you might try for QuiltCon next year? I know you have a lot of stuff going on! A friend is trying to convince me to submit the other quilt as a pattern for a magazine which means I’m back to not being sure if I should show it. Haha! 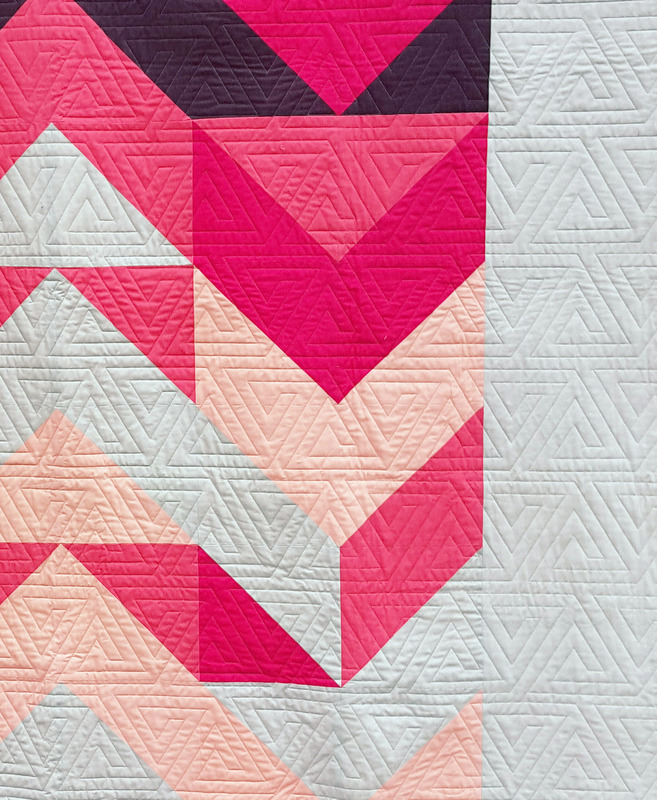 Stunning, even in all it’s pinkness and I love the quilting. Perfect choice. I’ve missed your bloggy posts, Anne! Though I’m not much of a pink gal, I love this one! The design is bold and the quilting is bang on. There’s no question in my mind that it should be hanging at QuiltCon. I will do my best not to be green with envy that you’re going! Aww, thank you!! I’ve really missed being able to blog more often. It’s basically now when I have a few moments to spare on Saturdays. This coming fall I’ll likely be moving and will hopefully have a MUCH shorter commute and get my evenings back again. Fingers crossed! Thank you so much for the quilt love! I really hope you can make it to QuiltCon sometime! To say I love this quilt would be an understatement! Love, love, love! Is there a pattern or guide somewhere so I can blatantly copy? Did I mention that I l o v e your quilt? Love the bold pattern. Works in pink, but other colors would be fine, too !! It’s stunning, and that fiddly bit of pink binding was totally worth the PITA-ness! Looking good and I love that quilting! 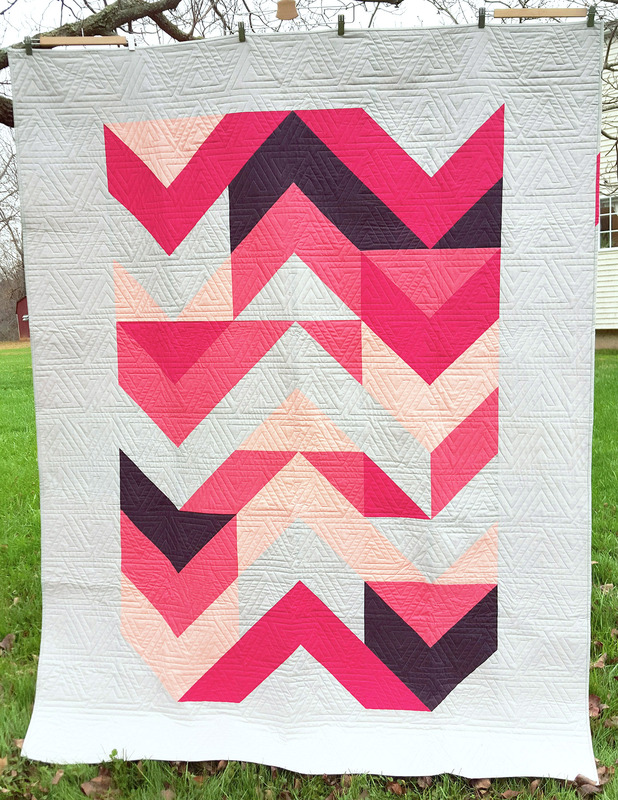 That’s a gorgeous quilt, even in pink! I have to say pink is not my comfort zone either but this one is gorgeous. Sorry to hear about your book. I didn’t know about it. Thank you for the condolences on my book. I am well over it now, but at the time it was certainly a bummer!